Justin: … in your lunch boxes you will also find a piece of paper with my phone number on it it in case you have any technical trouble during the game. Feel free to call it. Homeless Man: Yeah! I’ll call you! Justin: Please remember that all of your videos are silent, because we will be adding our own music to them during the judging. So no Shakespearean monologues, please. 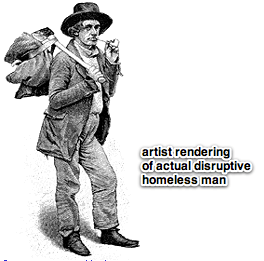 Homeless Man: Ha! Who are you? Richard III? Ha! Justin: Anyhow, who’s ready to get this thing started? Homeless Man: You’re not the President! Justin: One! The game is on.